The newly renovated Hotel Caravelle offers a new, contemporary feel with all the ammenities. What started as a community gathering has become a major event drawing top chefs, mixologists and winemakers to St. Croix. Oh how sweet it is! Just in time for A Taste of St. Croix, the newly renovated Hotel Caravelle is offering an experience designed to tickle you culinary chops. “Caribbean Spice & Everything Nice” includes two tickets to the annual celebration of food and wine, a copy of the St. Croix Food & Wine Experience Cookbook and a bottle of Cruzan Rum. Priced at $995, the five-night stay (April 13–18) is timed to coincide with the 15th annual festival showcasing the best of St. Croix’s culinary talent. This year’s event, featuring more than 50 exhibitors including local restaurants, farms, rums, wines and more, will be held April 14. Hotel Caravelle is bringing something new to the table this year. 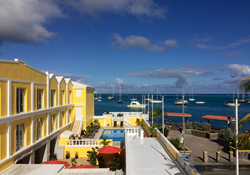 The hotel, located on the waterfront in the historic town of Christiansted and home to Rummrunner’s Bar & Restaurant, recently completed an extensive renovation transforming the landmark property into one of St. Croix’s “newest” lodging establishments. Updates include a redesigned lobby and lounge area, resurfaced pool and deck, and guestrooms welcomed all-new furnishings, brighter décor, new flooring, flat-screen televisions, sliding glass doors to showcase the expansive water view, complimentary high-speed Internet and WiFi, and more. 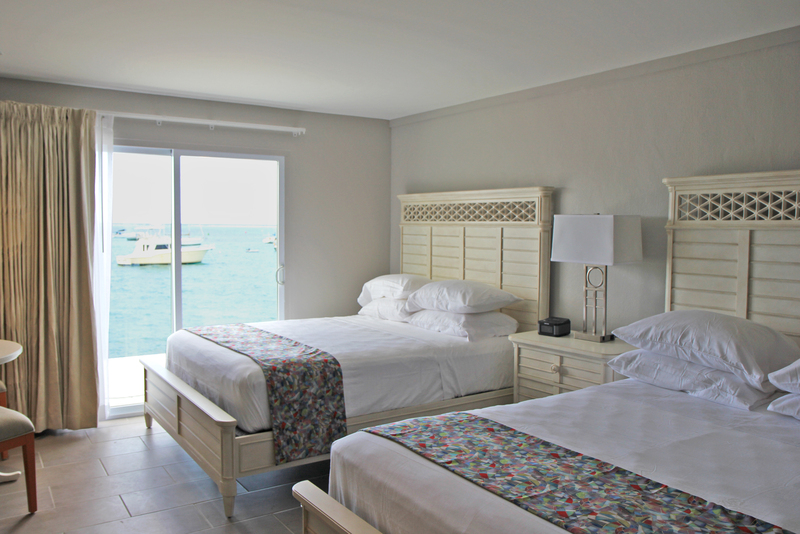 Located on the waterfront in the historic town of Christiansted, the newly renovated Hotel Caravelle blends European elegance with Caribbean charm. The hotel’s 43 rooms offer with all the amenities including a/c, satellite TV, phone, iron and ironing board, hair dryer and radio. The Penthouse Suite features a living room, two bathrooms and an oversized master bedroom. The award-winning Rumrunner’s waterfront restaurant and bar, located in Hotel Caravelle, offers breakfast, lunch and dinner. Hotel Caravelle is walking distance from cafes, shops, galleries and historic sites and buildings. For more information visit http://www.hotelcaravelle.com or call 800-524-0410. 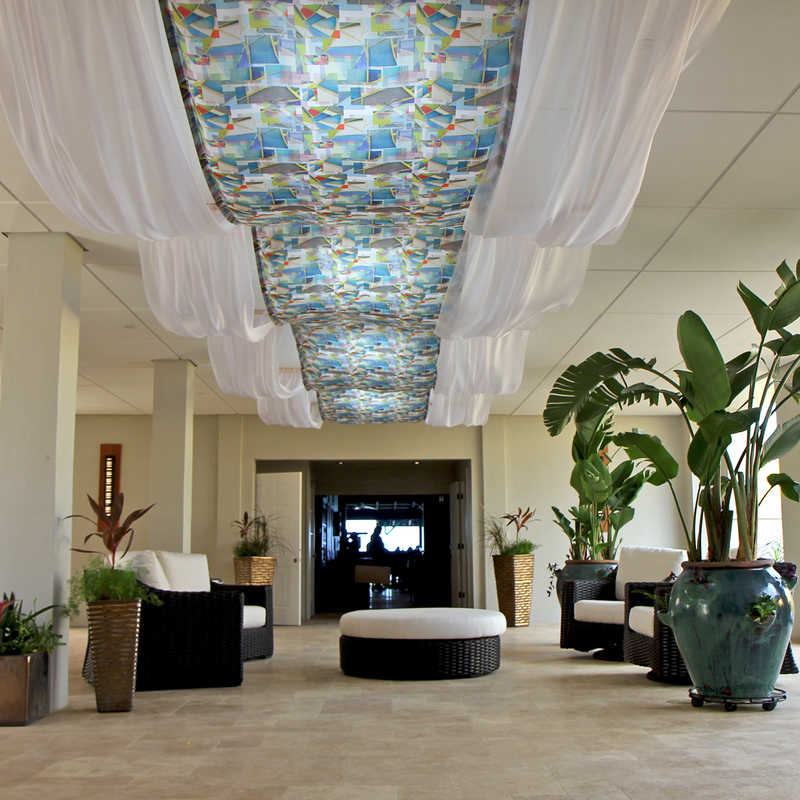 Hotel Caravelle's new lobby features textite art by Debbie Sun. The new room design at Hotel Caravelle is brighter, more relaxed with all new flooring, linens and furniture..